This fun little craft turned out pretty cute so I thought I would share it with you. It IS messy so be ready. This craft calls to use a large coffee filter. I couldn't find a coffee filter, so I tried a paper towel which I thought would work well, and it did. The first step is to take the article you are using and cut it into a watermelon slice shape. Now you want to dampen what you are working with. You don't want to SOAK it. Get it wet, squeeze it out, then open it up. Time to paint. I used my fingers to paint everything--always fun. First paint the green around the edge for the watermelon rhine. It is easiest to paint from the inside to the edge--that way the edge doesn't keep folding in. 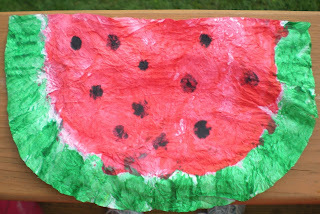 Next it's time to take the red paint and make the yummy part of the watermelon. Again, going from the center to the edge works best. Finally dipping a finger in the black paint and dotting the watermelon adds some great seeds. I thought it looked pretty good when it dried. Remember you can't really eat it! Good to know that paper towel is a prefect substitute for coffee filters. This turned out great. My daughter keeps requesting watermelons. This is an excellent and very cute idea. Thanks for sharing. What a fun idea and so perfect for summer. I'll be linking, thanks so much for the great idea! Thanks for finally talking about > "Watery Watermelon" < Liked it!